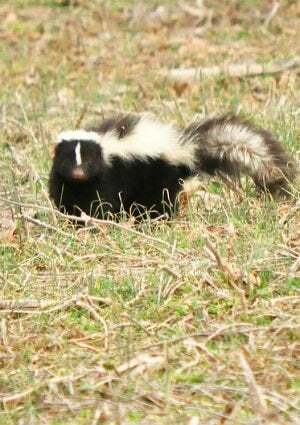 An unfortunate encounter with a skunk can mean weeks of a lingering stink. But with the right combination of cleaners, you can neutralize the odor on your body, your clothes, and inside your home before the day's over. 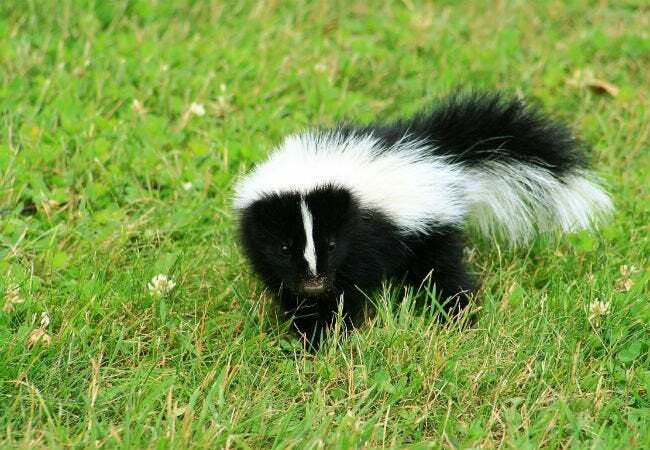 The stench of a skunk attack—it’s unmistakable, even when you’re in the passenger seat of a car, with the windows closed, driving through a neighborhood sprayed hours prior. But what do you do when there’s a skunk smell in your own backyard or worse, actually inside your house? Well, for one thing, you’ve got to act fast, ideally within an hour or two of the spray. If neglected, that foul odor could linger for months on household textiles, everything from bed linens to furniture upholstery. It can even wind up on your skin! Fear not: There are effective ways to neutralize the odor. Read on for how to get rid of skunk smell for good. Hydrogen peroxide ranks as perhaps your best weapon against the scourge of the skunk. Because it can damage the fibers of your clothing, however, it must be diluted prior to application. Mix one part hydrogen peroxide with six parts water, then soak your clothing in the solution for an hour or two. If the affected piece is delicate or dry clean only, skip the peroxide, opting instead for a staple of the pantry—vinegar. Though somewhat less effective than the alternative, vinegar works reasonably well to get rid of skunk smell, and it’s much less harsh. If you’re cleaning your clothes in a vinegar bath (one part vinegar, four parts water), leave the garments to soak a little longer, for as long as three hours. Once the recommended soaking time has elapsed, place your clothing into the washing machine, adding a half-cup of baking soda to your usual cycle. Finally, if you can, let the clothing dry outside. Believe it or not, the sun’s ultraviolet rays work to further break down any odor that still remains. If you tracked some of the offensive odor in with you and now need to know how to get rid of skunk smell indoors, don’t yet worry about washing everything. Start by placing open containers or bowls of vinegar in room corners or adjacent to any affected furniture. The vinegar should work to absorb odors over the course of the next day or two. Do your rooms still reek? For tile or stone countertops, scrub with diluted bleach (following the instructions printed on the bleach container). For wood, use water and ammonia. And for harder-to-wash materials, such as fabric curtains or wall-to-wall carpeting, think about hiring a steam cleaning service (or renting a steam cleaner and doing it yourself). If you or your pet has been sprayed, grab the hydrogen peroxide, baking soda, and dishwashing detergent. (If you’re outside when sprayed, send a family member indoors to retrieve the supplies.) Mix a quart of three-percent hydrogen peroxide, a quarter- to half-cup of baking soda, and a teaspoon of dishwashing detergent. Dip a rag into the solution, using it to rub yourself down or to wash your pet. Avoid the eyes and any sensitive area. When you’re finished, dump the mixture; it shouldn’t be stored (this potent brew can actually destroy its container). No matter the game plan, do your best to air out the house by opening windows, using fans, and changing your HVAC filters. Most of all, remember that addressing the skunk smell immediately can save you days of multiple showers and endless household cleanings. This, too, shall pass!